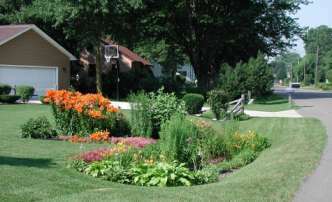 Homeowners across the country are catching on to rain gardens – landscaped areas planted with wild flowers and native vegetation that soak up rain water runoff from buildings and concrete patios and driveways. Today, they are even experimenting with porous driveway surfaces that allow absorption of rain water to aid in reducing storm water runoff. Why are rain gardens important? As cities and suburbs grow and replace forests and agricultural land, increased storm water runoff from impervious surfaces has become a problem for our natural habitat and drinking water sources. storm water runoff from these areas increases flooding, carries pollutants from streets, parking lots and lawns into local streams and lakes. For your convenience, we have provided a copy of the Iowa Rain Garden Design and Installation Manual. Send us photos of your rain garden and we will post them on this site!